Workers of an electronics factory in the Cavite ecozone are preparing to go on strike once more due to the mass termination of all union officers. The all-women labor union at the Lakepower Converter Inc. filed a notice of strike after mediation talks last Wednesday broke down due to the refusal of management to reinstate eight union officers who were terminated. 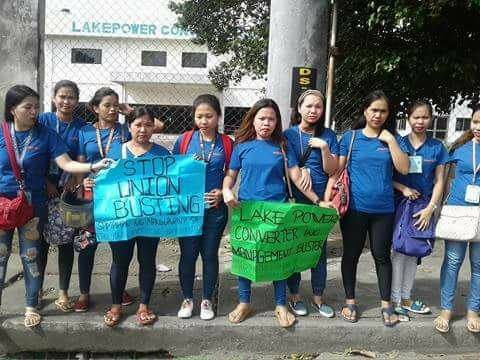 The Lakepower women workers went on a five-month strike that started in December 2017 to demand a stop to the harassment of union officers and members. The strike was settled last April due to the intervention of the Department of Labor and Employment. As part of the agreement, 64 union officers and members were to return to work. “However, Lakepower reneged on the agreement. It reinstated union members but immediately suspended union officers. After a month-long suspension, they were then terminated. This is obviously a case of union busting,” declared Rene Magtubo, chair of Partido Manggagawa (PM), which is assisting the Lakepower women workers. Lakepower is a Taiwanese-owned parts supplier to global electronics companies like Recom Power, Arrow Electronics, Asus and Texas Instruments. To avert another strike, the National Conciliation and Mediation Board is calling the management and union to conciliation meetings next week. Magtubo asserted that union busting and harassment of unionists in Lakepower is not an isolated case in the export processing zones. Last week, PM condemned the posting of a “wanted list” of unionists at the gate of the Mactan, Cebu Economic Zone and its security office. Also last week, in the middle of negotiations for a collective bargaining agreement (CBA), a union president and vice president were arrested due to a criminal complaint in Valenzuela. “We are alarmed at this disturbing pattern of unionists being treated as criminals. Unionism is not a crime. But with the prevailing culture of impunity, employers are emboldened to criminalize unionists and treat them as terrorists,” asserted Magtubo. A global union body had listed the Philippines as among the worst countries for workers in its 2018 Global Rights Index. Names and pictures of Myra Opada, Luzelie Gesta and Aurelia Parangan were on the “wanted list” in the Mactan ecozone. Opada is union president at Philippine Light Leather Corp. (PLLC), Gesta is secretary of the union and Parangan is an active member. All three have been terminated by PLLC management but the workers have filed cases of union busting, unfair labor practice and illegal dismissal. Meanwhile, the president and vice president of the labor union at the Nation Paper Products and Printing Corp. (NAPPCO) were arrested and detained at a Valenzuela police station for two days. The CBA negotiations were cancelled as a result of the arrest and detention.